I first began volunteering at Manzil, an NGO for low-income students in Central Delhi, in 2017. There, I occasionally organized cricket matches as a fun way of engaging my students after classes, and was struck by how joyful these children were while playing these games. After all, who doesn’t like sports? They’re a great way to learn the art of teamwork, discipline and building friendships. However, there is very limited scope for meaningful engagement in organized sports for low-income kids, and even less opportunity to enroll in some kind of formal training. As a result, these kids lack specific goals that they could work toward, like a tournament or a league. In the process, a lot of untapped potential is missed out on. Once I realized the problem, I was determined to provide the kids with a space that allowed them to cultivate and develop their talents. So, I decided to start a tournament in partnership with Manzil, called the Little Cricket League (LCL), complete with teams, schedules, and trophies. 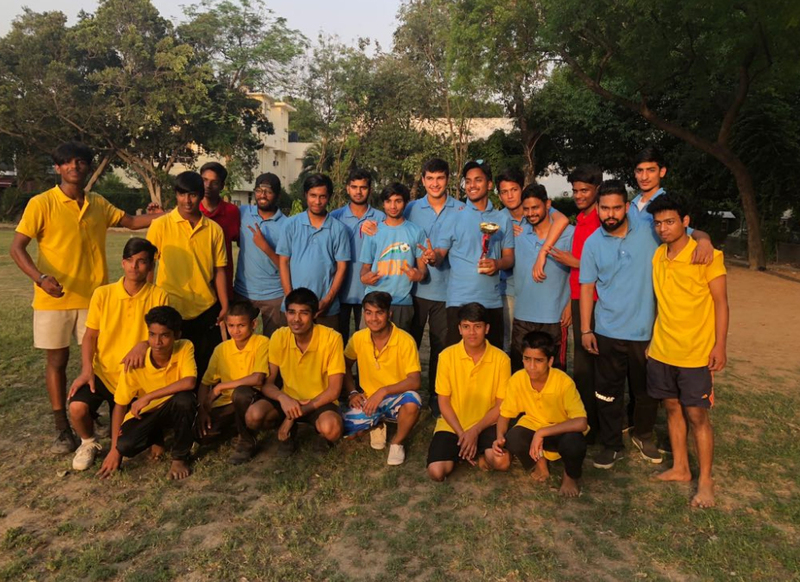 LCL is a sports training program aimed at broadening access to competitive sports for the underprivileged youth of New Delhi. It comprises of approximately 60 students divided into teams of vibrant red, green and blue. The road to establishing LCL came with its set of challenges. Apart from getting approval from Manzil, I had to find a ground, procure equipment and begin training for twenty students. Training didn’t just include teaching back-spins or slip-positioning. I also had to teach them how to function as a team. That is when I realised that teaching is the greatest exercise in learning: I learnt team-building by training people to be team players. By the end of the training sessions, I wasn’t sure who was teaching whom. All I knew was that we were inching toward our goal. As the first game day approached, we realized that it was finally time to test ourselves. The twenty students were divided into two teams of ten. Wearing my umpire’s cap, I tossed the coin and blew the whistle. The game had begun. The young cricketers exhibited great passion while they spun the ball and swung their bats. It was amazing to witness the results of simply providing a space for them to meet and play. The field had come alive, and the spirit of sportsmanship was pervasive. I felt inspired. I wanted to go beyond one match, two teams, and twenty children. The logical next step: a full-fledged cricket league. However, in order to organize a tournament, I needed more players. I began contacting other NGOs, and so far, I’ve successfully partnered with five NGOs apart from Manzil. LCL is expanding with more children showing interest in these friendly tournaments. But my work has only just begun. According to a report published by DASRA, less than 1% of the country’s population under the age of 35 has access to organized sport. But as I arrange each match of the LCL – fighting each battle, convincing each NGO, arranging each playing field – I can sense the tide turning my favour. I have learnt more about business in the last several months than I have in any class, gaining experience on how to organize, how to lead, and how to bring people together to work towards something collective. What felt like a distant dream just a few months ago is slowly but surely shaping into reality. No matter which team wins or loses today, we have already won together. Rayaan Taneja is a Grade 12 student at The Shri Ram School. He is extremely interested in psychology, economics, math, and history, and is currently pursuing these subjects at school. He is also a member of the Economics and Heritage society at school, where he conducts debates, discussions, quizzes, and other activities for his fellow students. Rayaan’s heart lies in sports. He is an avid athlete and has been in the school’s cricket team for the past 3 years. He also enjoys volunteering and working with children from low income families and so he spends his free time at Manzil and Parvah, two NGO’s in Central Delhi. There, he organises sports training and competitive informal events for children. Rayaan believes in the power of sports and its ability to transform the lives of people, which motivated him to create The Little Cricket League.